Travel Vilnius - Moscow with ECOLINES buses. Comfortable seats, tablet - movies, music. WC, WiFi, 220V, drinks - coffee, tea. 3 free bags. To find out ticket price and bus schedule, please visit the sales system. Campaign valid from 31.08.2018 till 13.06.2019. Only for journeys from 10.01.2019 till 26.04.2019. Only for journeys from 10.05.2019 till 13.06.2019. ATTENTION! From May 15, stop Moscow (Tushinskaya bus station) IS CLOSED. -Distance between cities — 960 km. -Average time on road in route Vilnius — Moscow: 16 h 42 min. -Time zones difference between the cities Vilnius and Moscow - 0 hours. 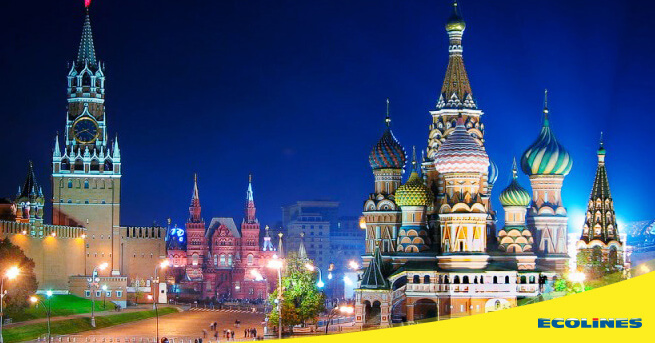 We hope you will choose to travel Vilnius — Moscow with ECOLINES and have a comfortable trip!